This quiz is based on the information presented in Ultra Low Power Bioelectronics: Fundamentals, Biomedical Applications, and Bio-Inspired Systems, by Rahul Sarpeshkar, published by Cambridge University Press. 1. Which formula represents what is known as "1/f" noise? 2. What is Return Ratio Analysis? an additional passive element is added in parallel? 4. What function does a gyrator circuit perform? 5. What is a key feature of a neuron-inspired analog-to-digital converter? 6. What does the Bode-Fano criterion state? 7. Which type of biomedical implant is not likely to employ a wireless link to an external transceiver? 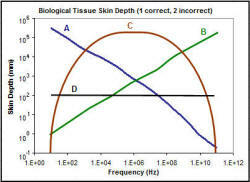 skin depth in biological tissue? human male brain, consisting of 22 billion neuronal cells?